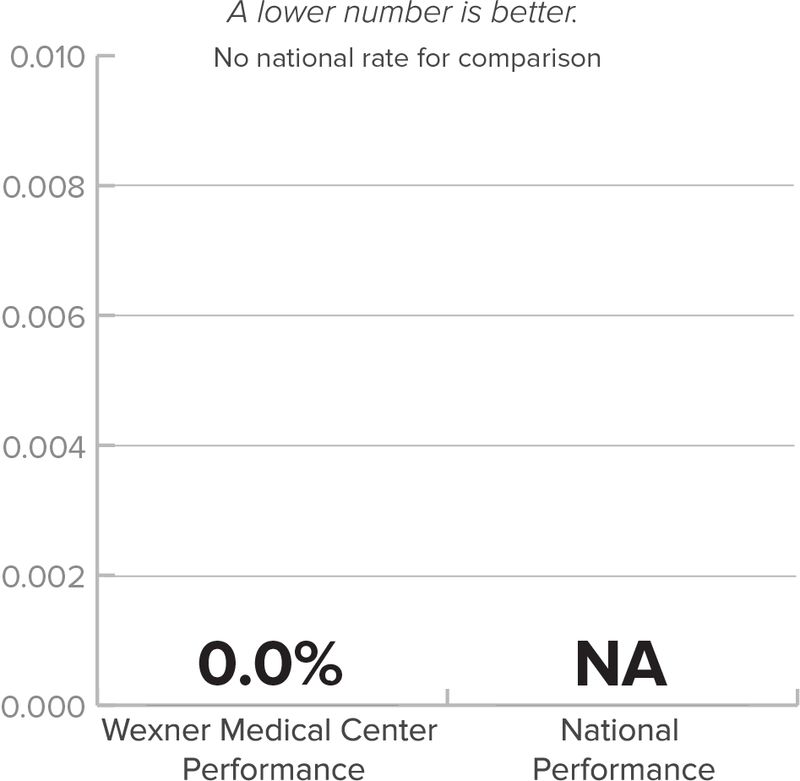 Outcome measures from CMS look at how well patients fare once they’ve been admitted to the hospital. This includes rates of infections, complications, readmissions and deaths related to the care of common conditions such as stroke, heart attack, hip and knee surgery and pneumonia. 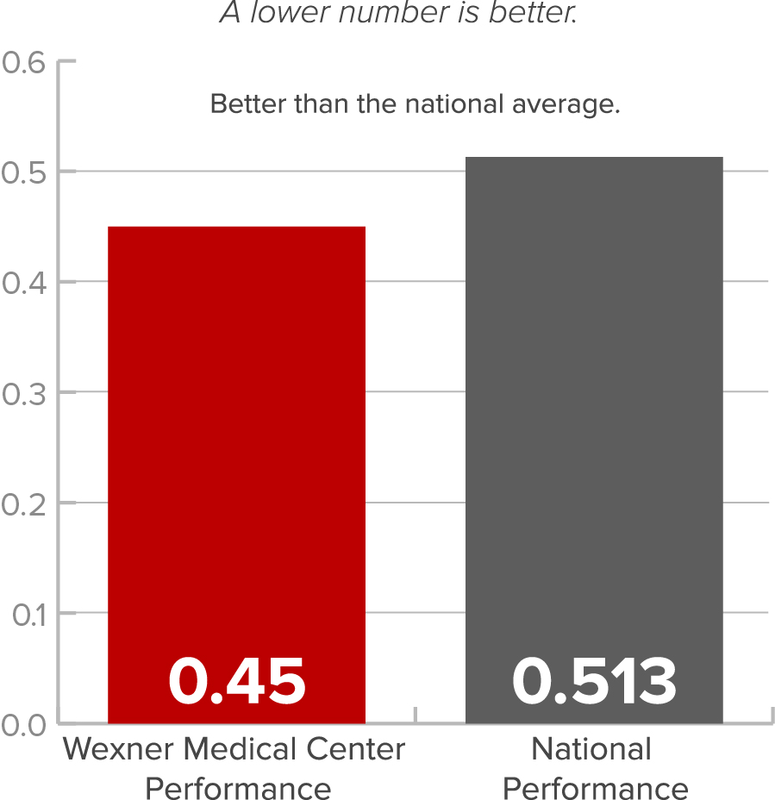 At Wexner Medical Center, our outcome measures are consistently better than or the same as the national averages. This information shows the number of Medicare patients over the age of 65 who died within 30 days of being admitted to the hospital. The information is based on the reason they were admitted to the hospital, and is “risk-adjusted,” meaning that the calculations consider how sick the patients were when they first came to the hospital. A lower rate is better. Heart Attack or Acute Myocardial Infarction (AMI) 30-day mortality 15.1% 13.2% No different than the national rate. 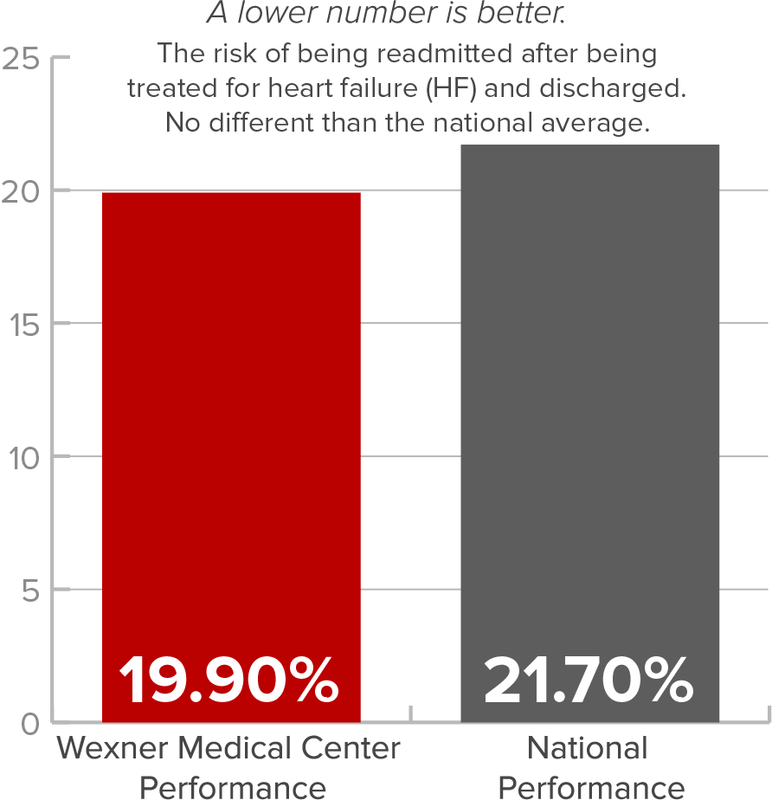 Heart Failure 30-day mortality 9.1% 11.7% Better than the national rate. 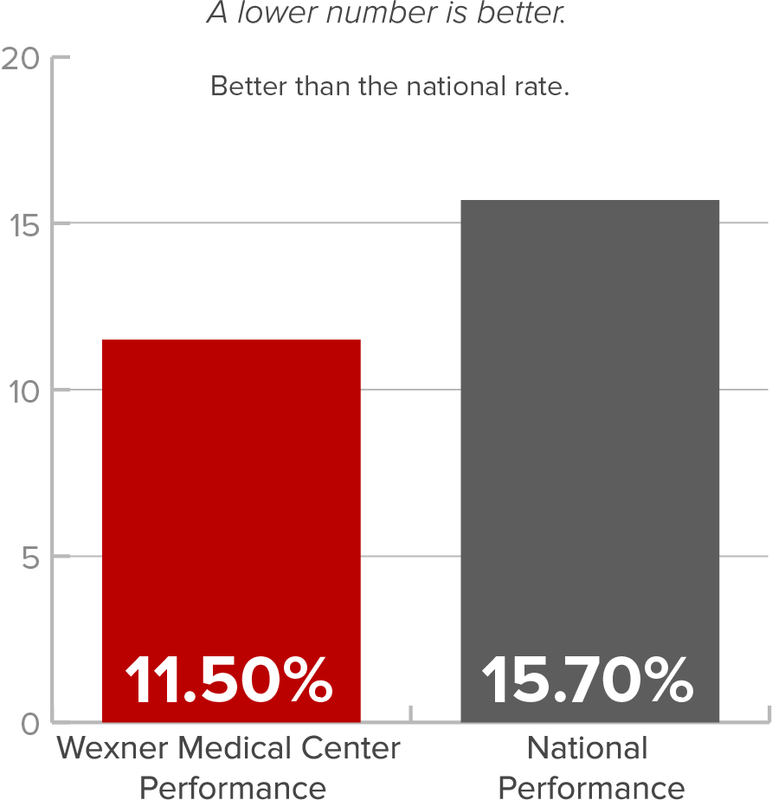 Pneumonia 30-day mortality 11.5% 15.7% Better than the national rate. 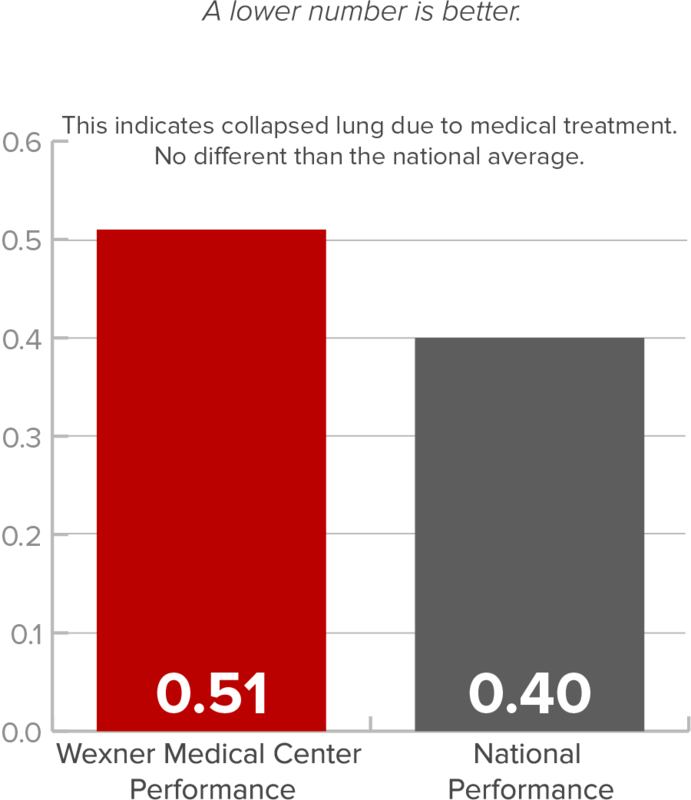 Chronic Obstructive Pulmonary Disease (COPD) 30-day mortality 6.7% 8.3% No different than the national rate. 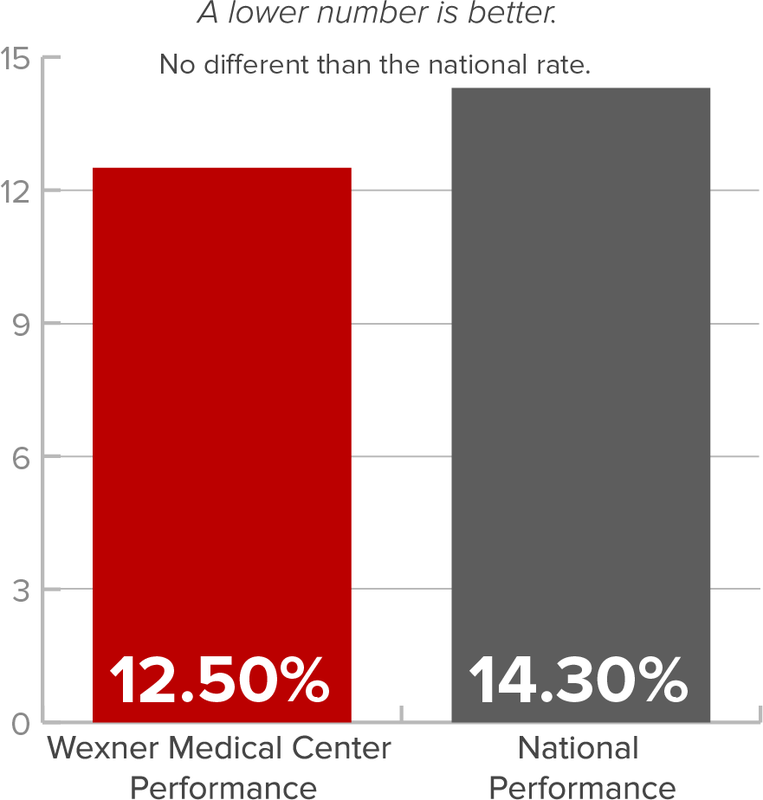 Stroke 30-day mortality 12.5% 14.3% No different than the national rate. 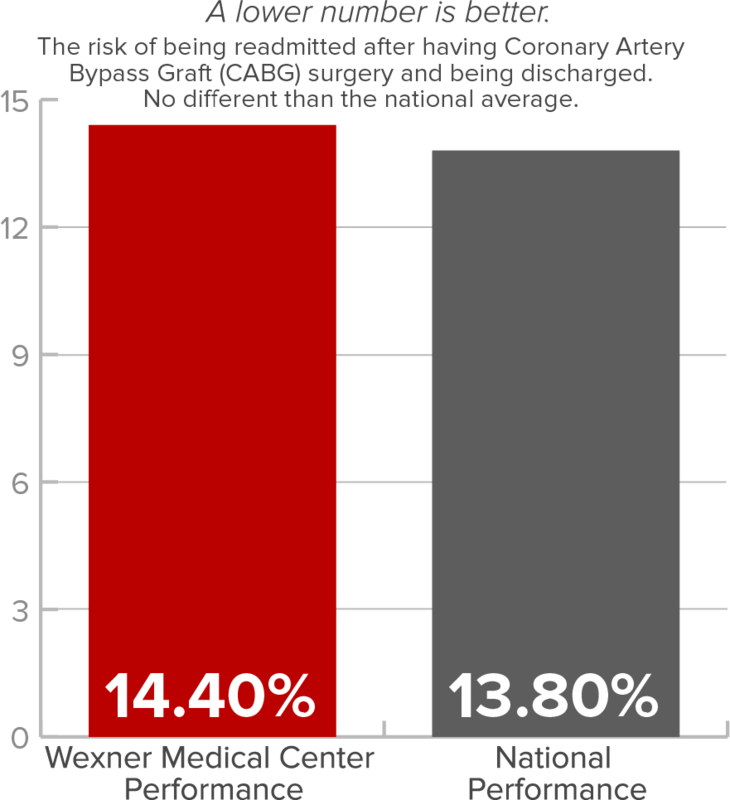 Coronary Artery Bypass Graft (CABG) surgery 30-day mortality 2.4% 3.1% No different than the national rate. This information shows the rate of Medicare patients over the age of 65 who were readmitted to the hospital within 30 days of discharge. CMS chose to measure unplanned readmission within 30 days instead of over longer time periods, because readmissions after that may be impacted by other factors such as patients’ own behavior or care provided to patients after discharge. The information is “risk-adjusted,” meaning that the calculations consider how sick the patients were when they first came to the hospital. A lower rate is better. 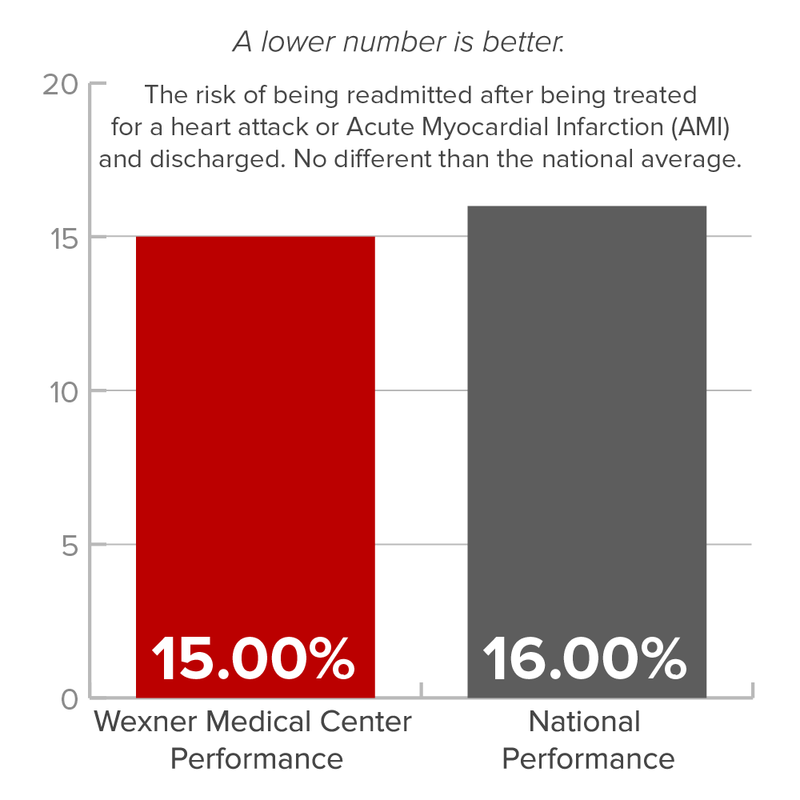 AMI 30-day risk standardized readmission 15.0% 16.0% The risk of being readmitted after being treated for a heart attack or Acute Myocardial Infarction (AMI) and discharged. 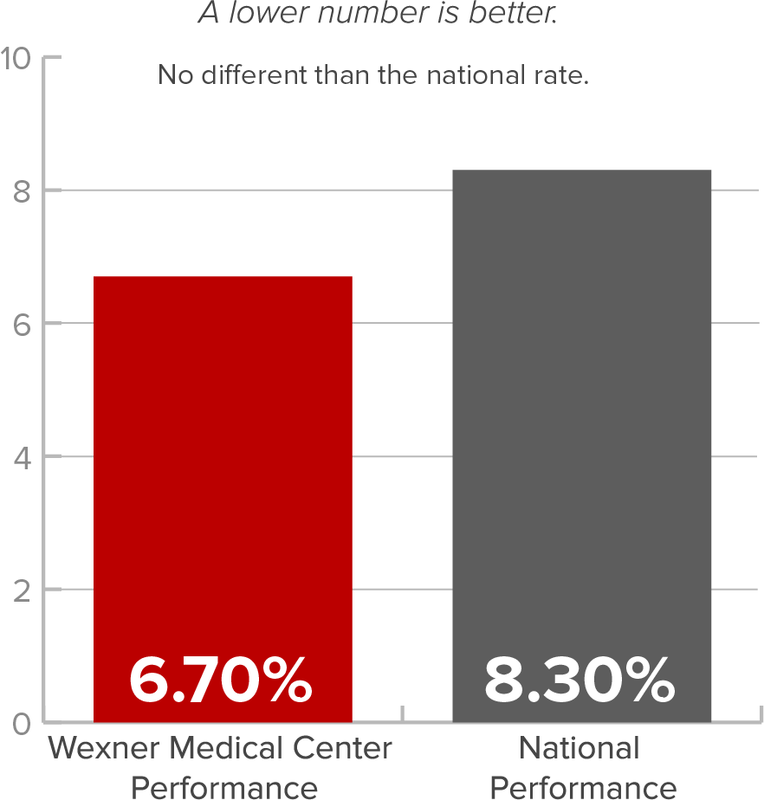 The difference between our rate and the national average is not statistically significant. HF 30-day risk standardized readmission 19.9% 21.7% The risk of being readmitted after being treated for heart failure (HF) and discharged. 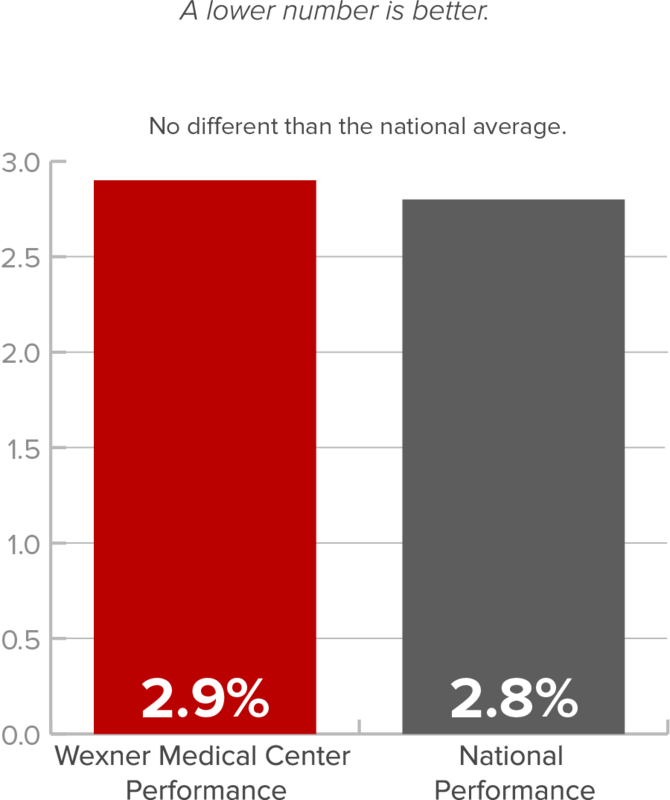 The difference between our rate and the national average is not statistically significant. 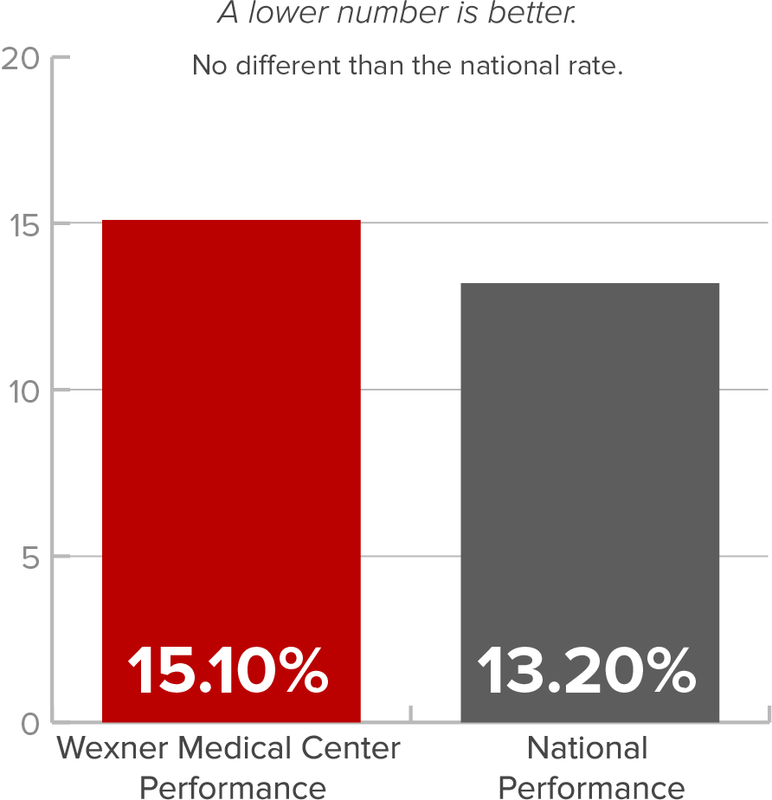 Pneumonia 30-day risk standardized readmission 15.8% 16.7% The difference between our rate and the national average is not statistically significant. 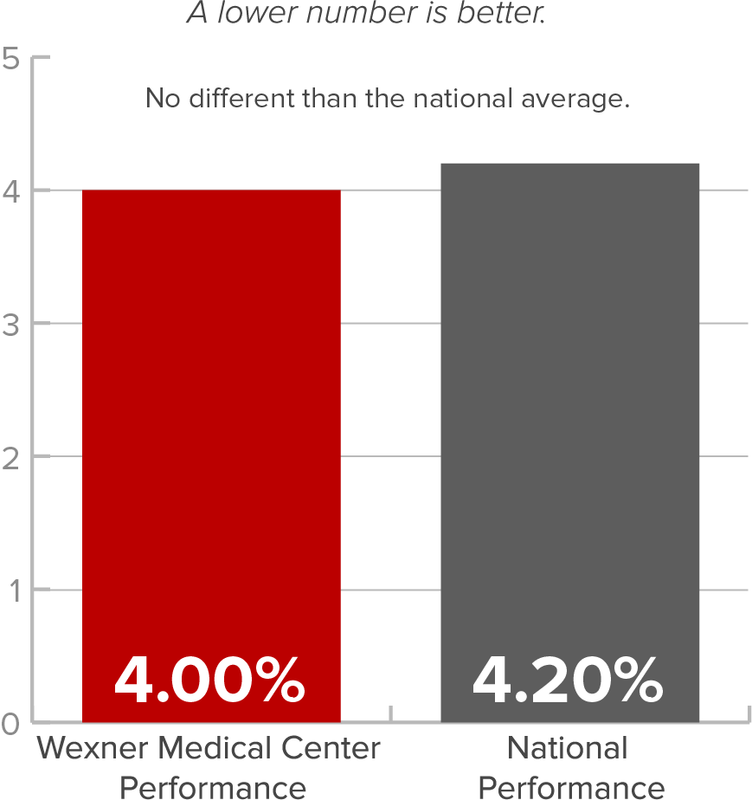 Hip-Knee 30-day risk standardized readmission 4.0% 4.2% The difference between our rate and the national average is not statistically significant. 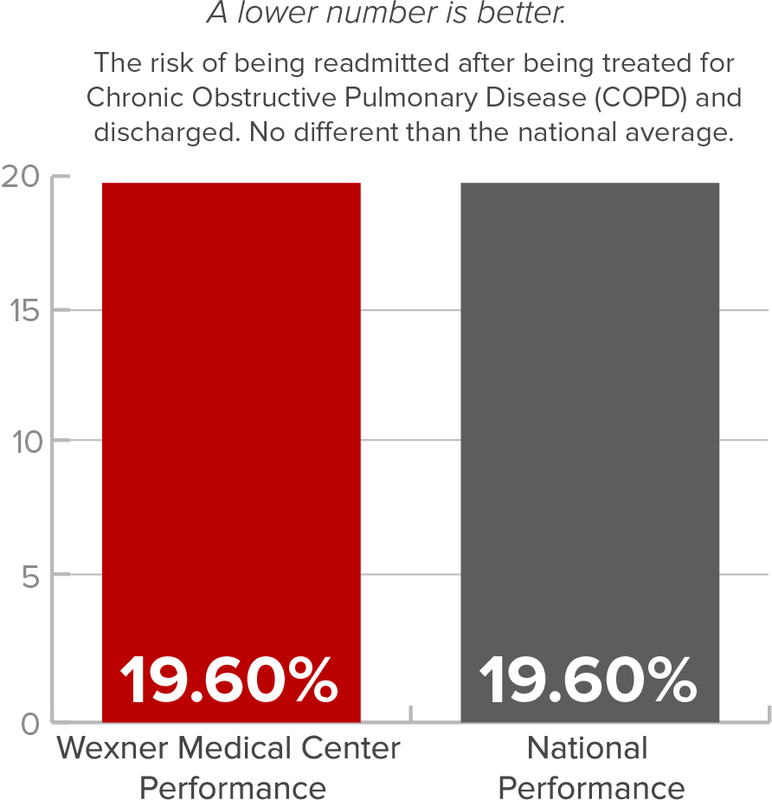 COPD 30-day risk standardized readmission 19.6% 19.6% The risk of being readmitted after being treated for Chronic Obstructive Pulmonary Disease (COPD) and discharged. 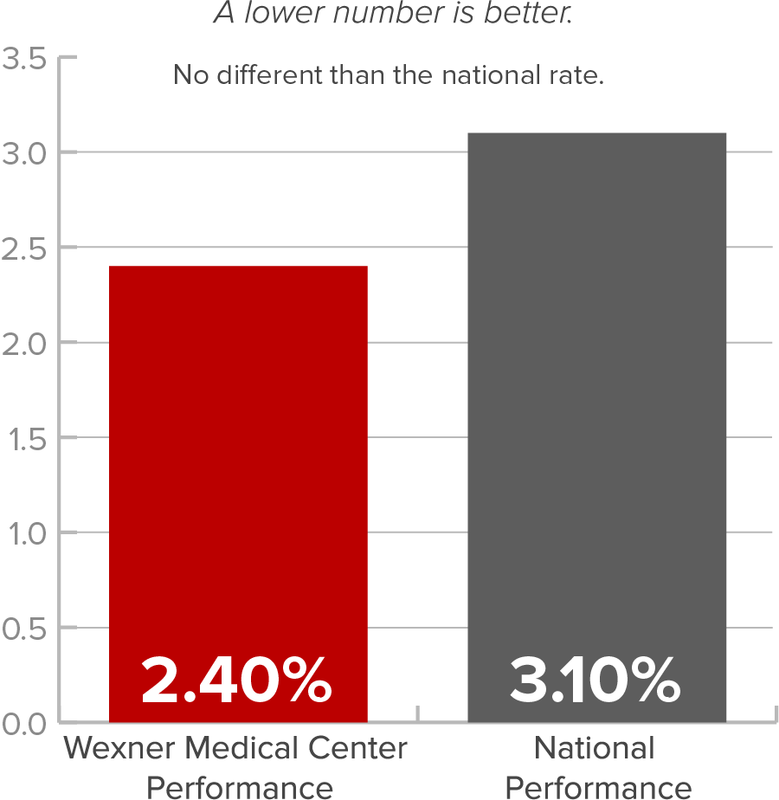 The difference between our rate and the national average is not statistically significant. 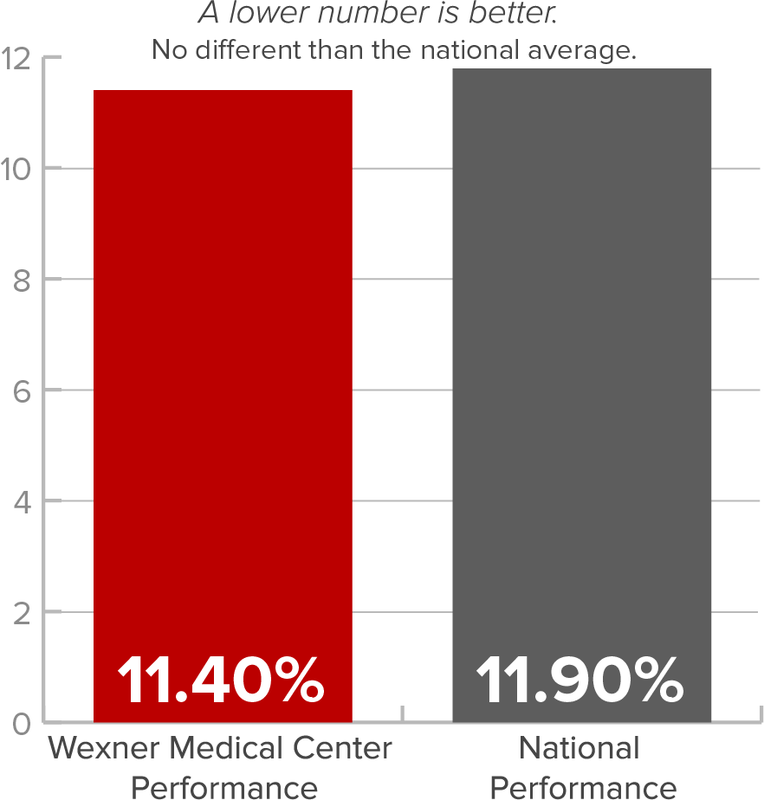 Stroke 30-day risk standardized readmission 11.4% 11.9% The difference between our rate and the national average is not statistically significant. CABG 30-day risk standardized readmission 14.40% 13.80% The risk of being readmitted after having Coronary Artery Bypass Graft (CABG) surgery and being discharged. 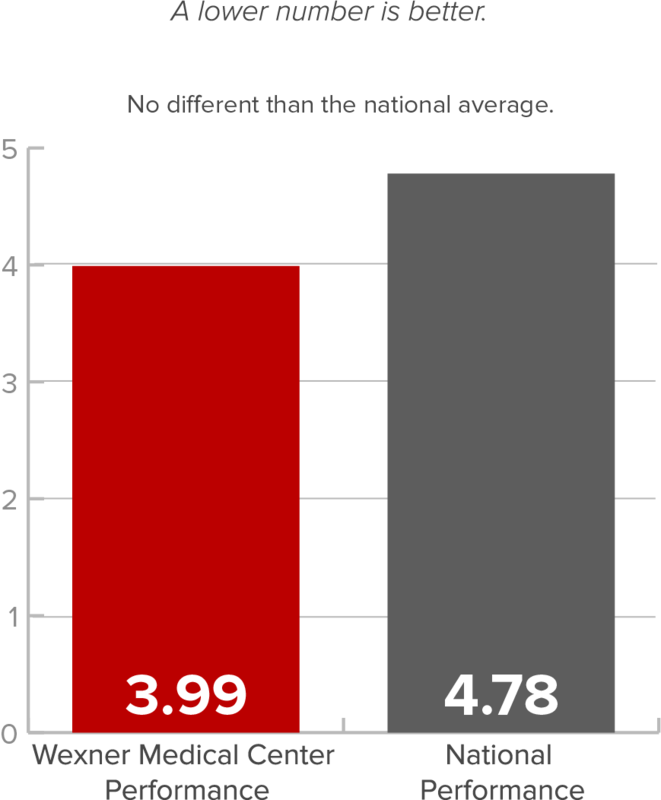 The difference between our rate and the national average is not statistically significant. Hospital- Wide 30-day risk standardized readmission (July 2015 - June 2016) 14.70% 15.30% The overall risk of being readmitted after receiving internal medicine, surgery/gynecology, cardiorespiratory, cardiovascular, or neurology services. 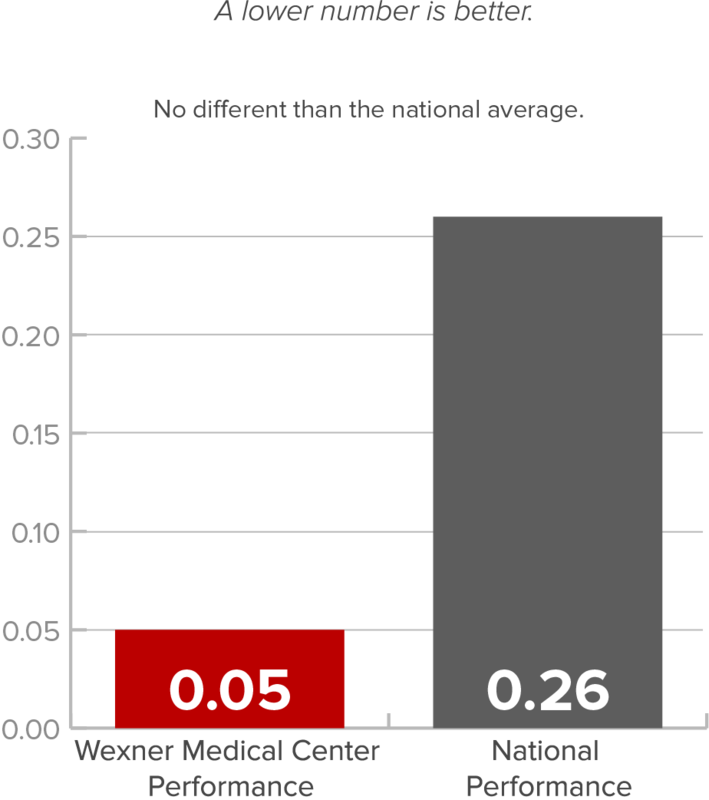 The difference between our rate and the national average is not statistically significant. Patient Safety Indicators are measures of serious complications that are drawn from the Agency for Healthcare Research and Quality (AHRQ). This includes falls, accidental cuts, infections, collapsed lungs and blood clots. 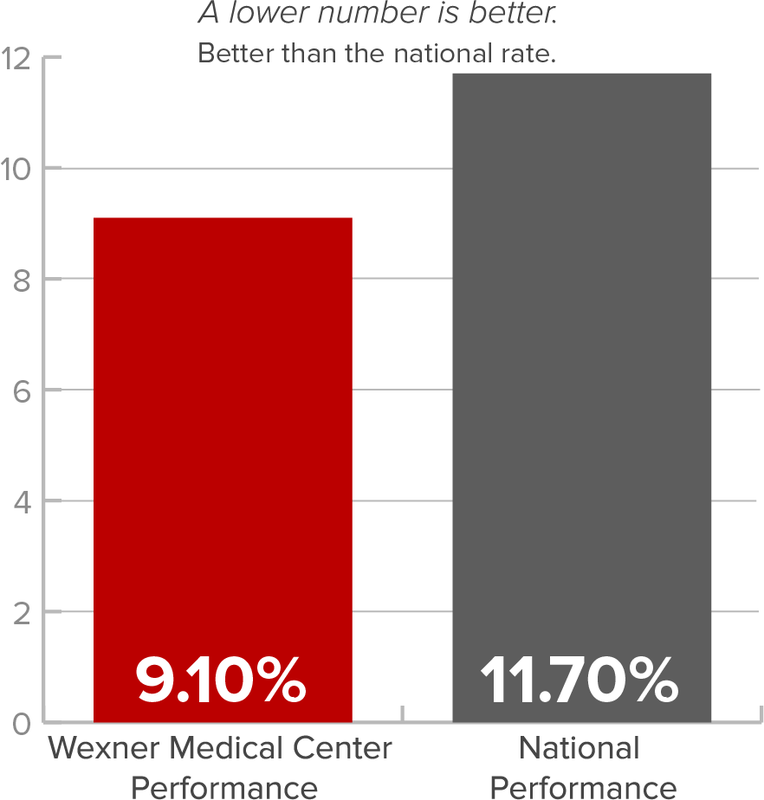 The rates reflect per 1000 patient discharges. 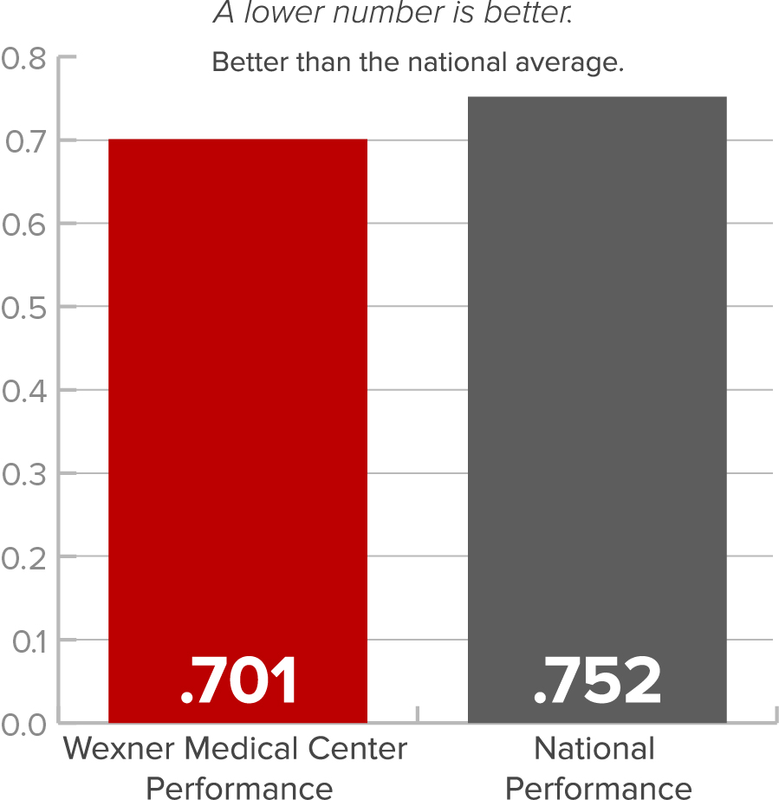 In nearly all indicators, Wexner Medical Center ranks better than or on par with the national average. Complication/Patient Safety for Selected Indicators (composite) 0.80 1.00 This is a summary or composite number of all serious yet potentially avoidable complications that occurred during surgical or medical inpatient care. Better than the national average. 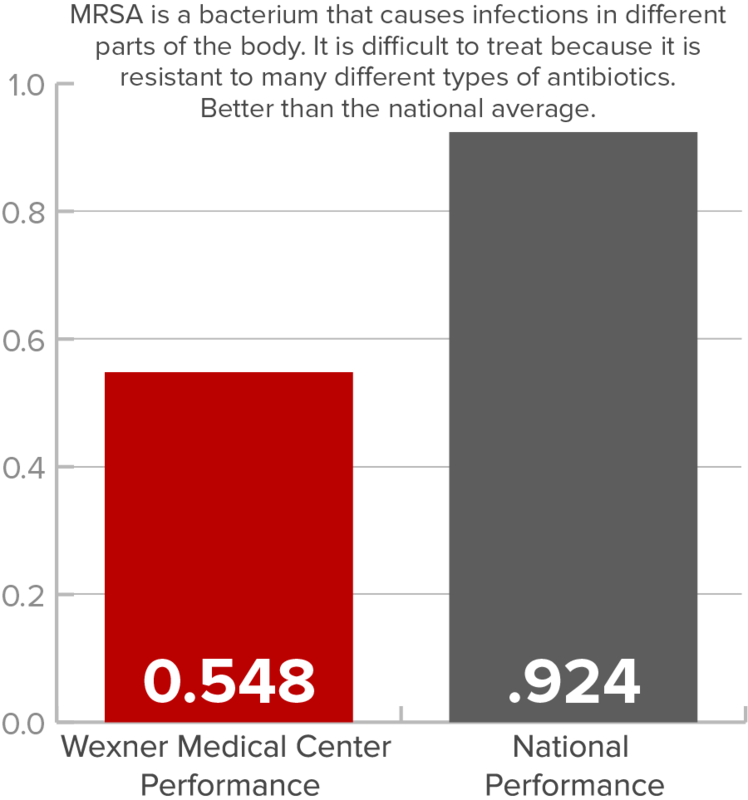 (PSI-3) Pressure Ulcer Rate 0.05 0.26 No different than the national average. (PSI-4) Death among surgical inpatients with serious treatable complications 99.72 139.05 Better than the national rate. (PSI-6) Iatlrogenic pneumothorax, adult 0.51 0.40 This indicates collapsed lung due to medical treatment. No different than the national average. 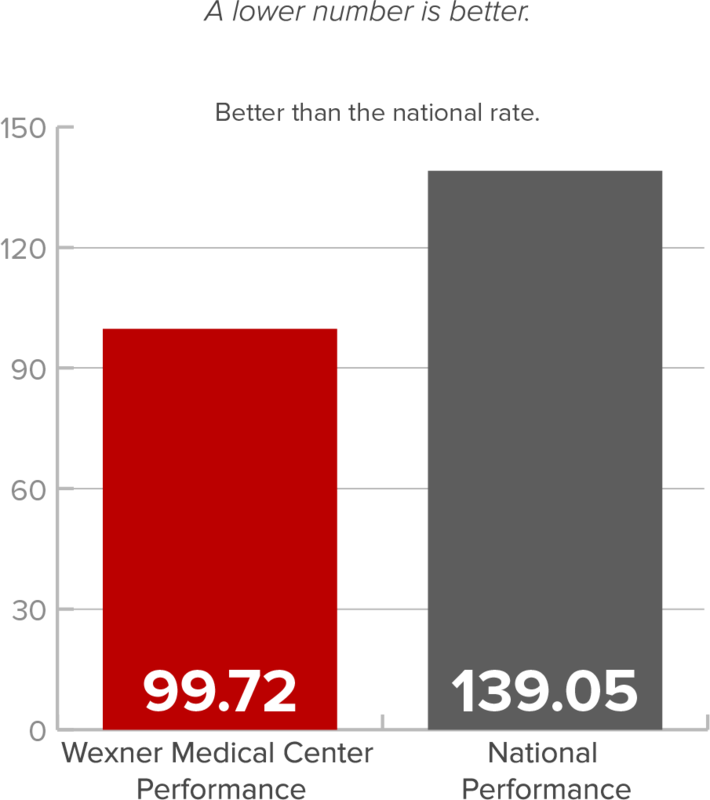 (PSI-8) Postoperative Hip Fracture Rate 0.12 0.10 No different than the national average. 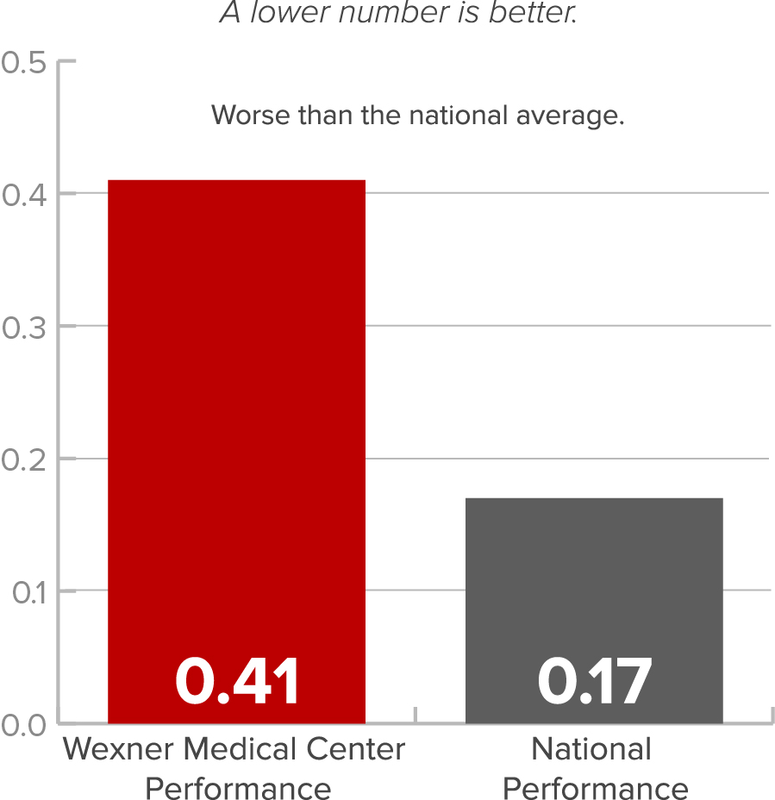 (PSI-9) Postoperative Hemorrhage or Hematoma Rate 3.99 4.78 No different than the national average. (PSI-10) Postoperative Acute Kidney Injury Rate 1.19 1.12 No different than the national average. 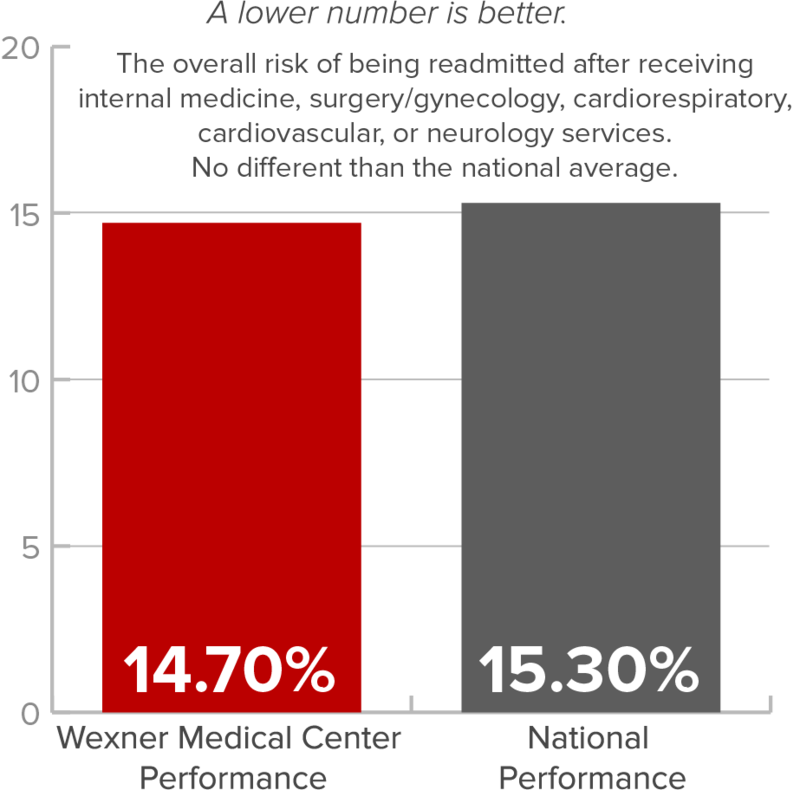 (PSI-11) Postoperative Respiratory Failure Rate 6.08 11.89 Better than the national rate. 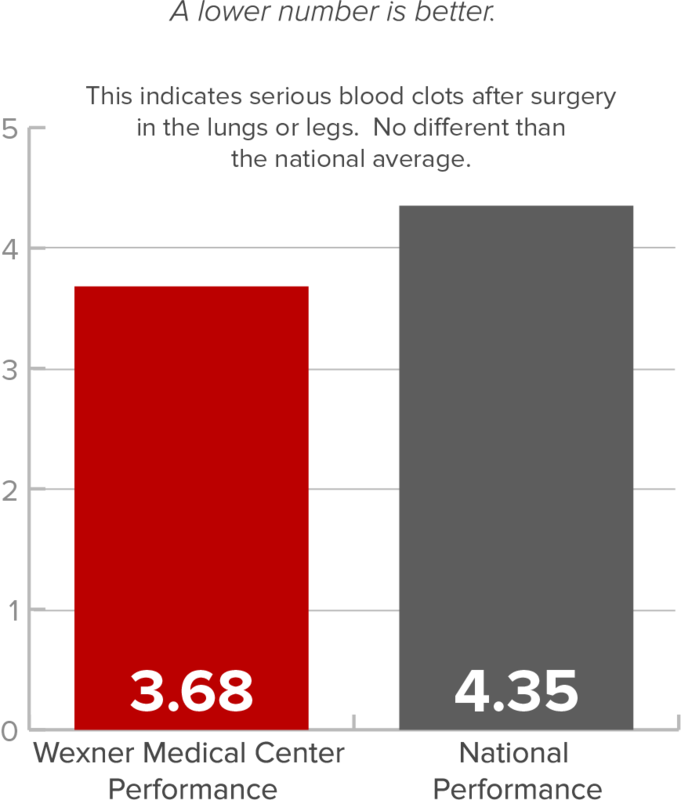 (PSI-12) Post-Operative Pulmonary Embolism (PE) or Deep Vein Thrombosis (DVT) 3.68 4.35 This indicates serious blood clots after surgery in the lungs or legs. 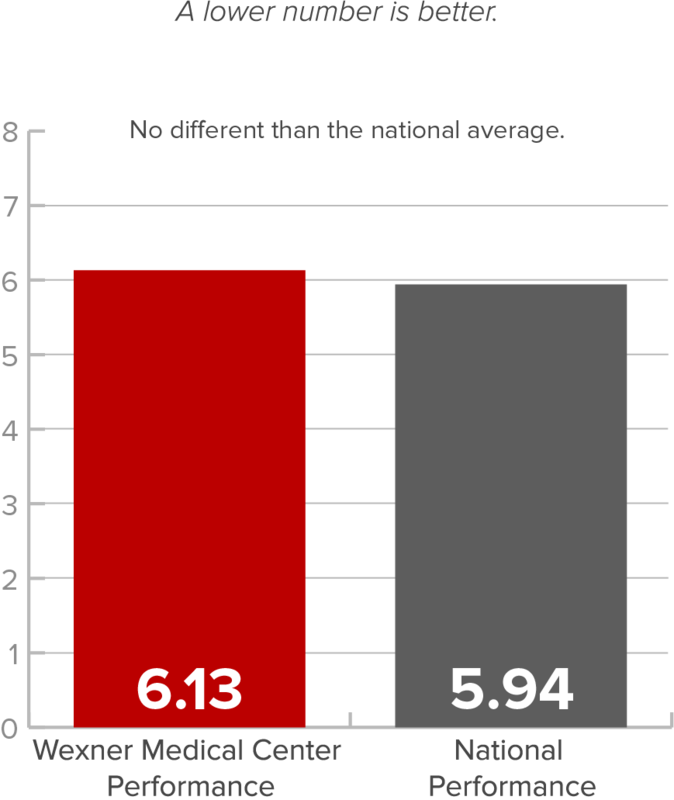 No different than the national average. 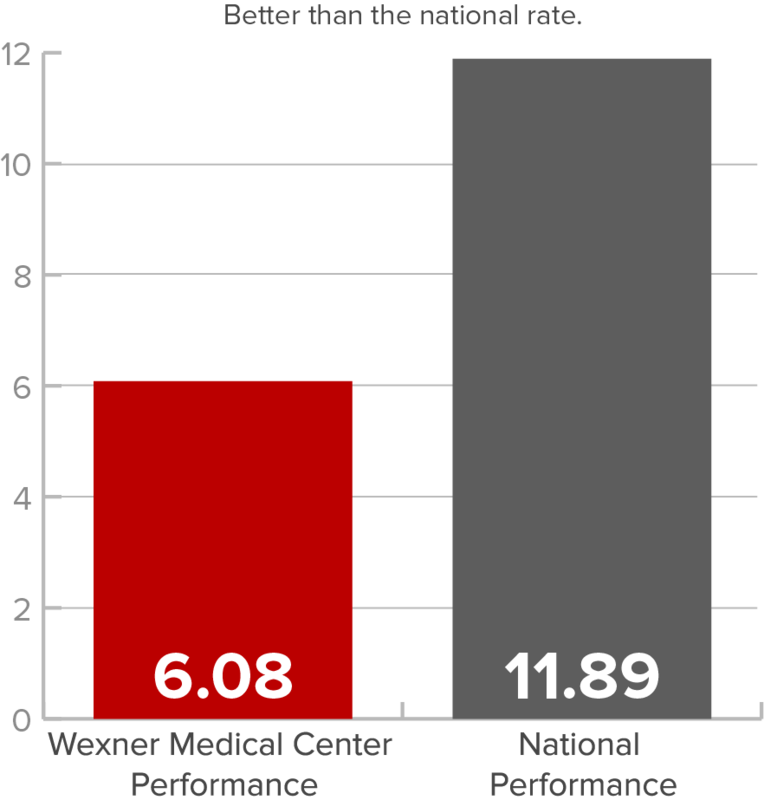 (PSI-13) Postoperative Sepsis Rate 6.13 5.94 No different than the national average. 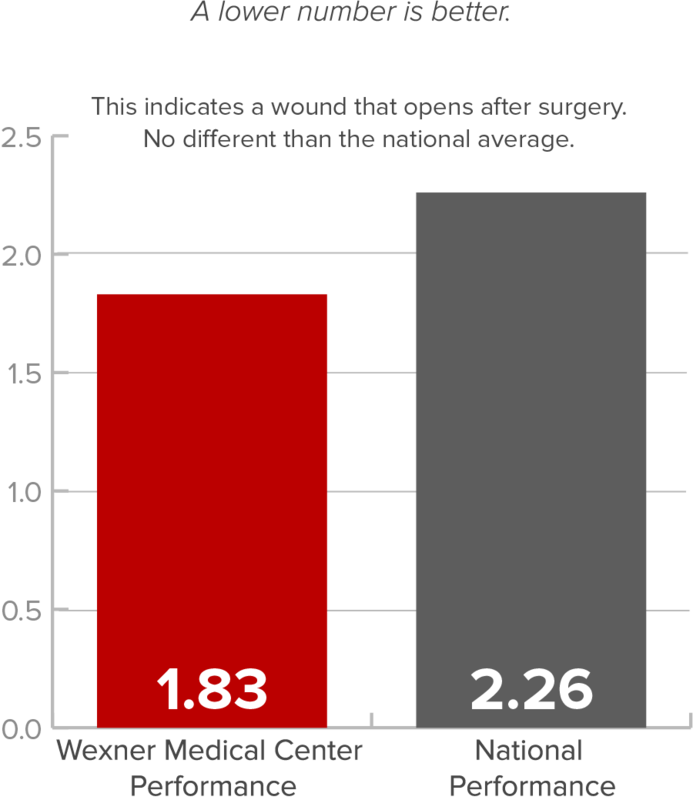 (PSI-14) Postoperative wound dehiscence 1.83 2.26 This indicates a wound that opens after surgery. No different than the national average. 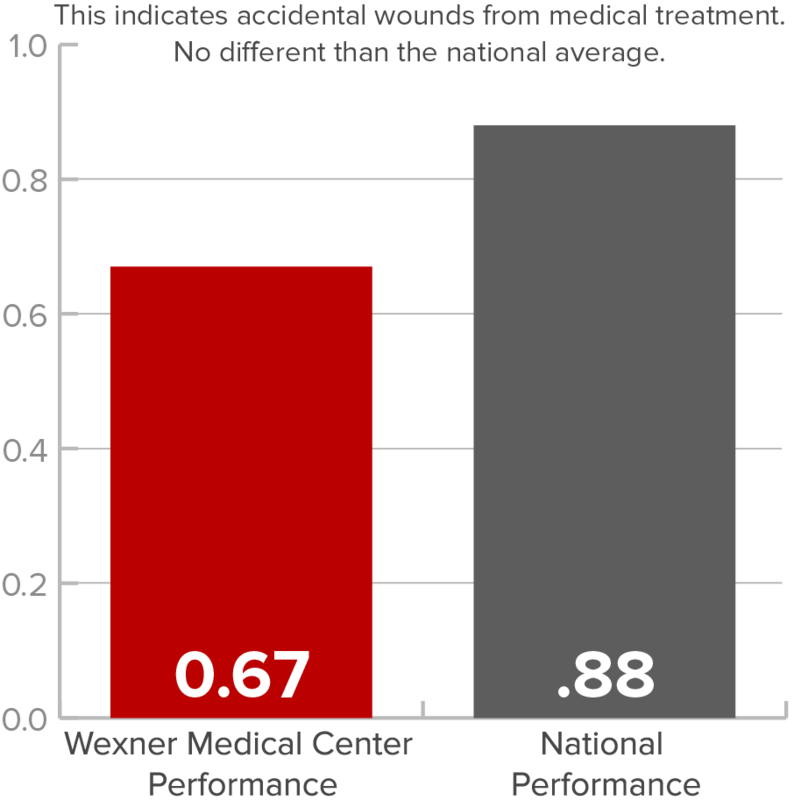 (PSI-15) Accidental puncture or laceration 0.67 0.88 This indicates accidental wounds from medical treatment. 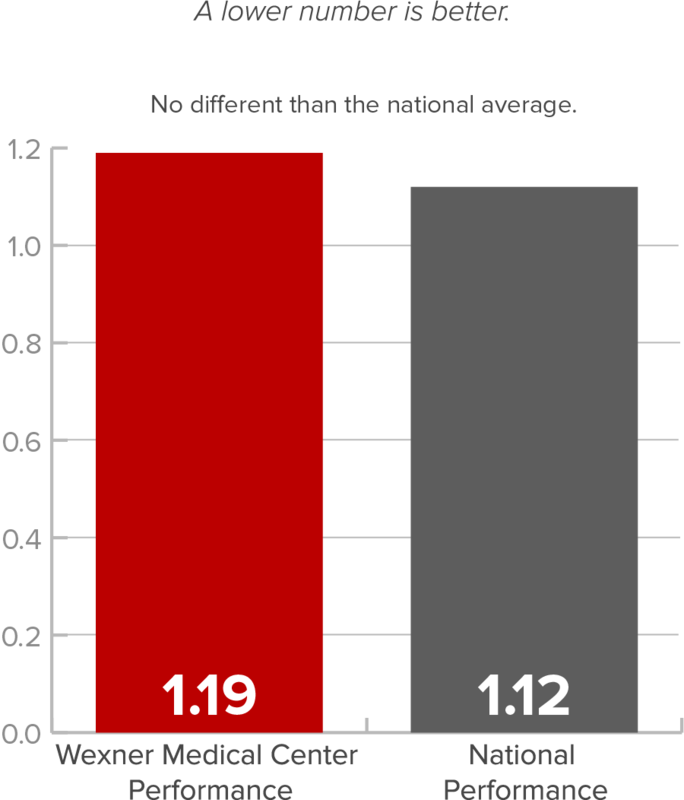 No different than the national average. Surgical Complications of hip and knee replacement patients includes up to eight different complications that can follow surgery such as heart attack (acute myocardial infarction [AMI]), pneumonia, surgical site bleeding, blood infections, blood clots, death, and prosthetic joint infection. 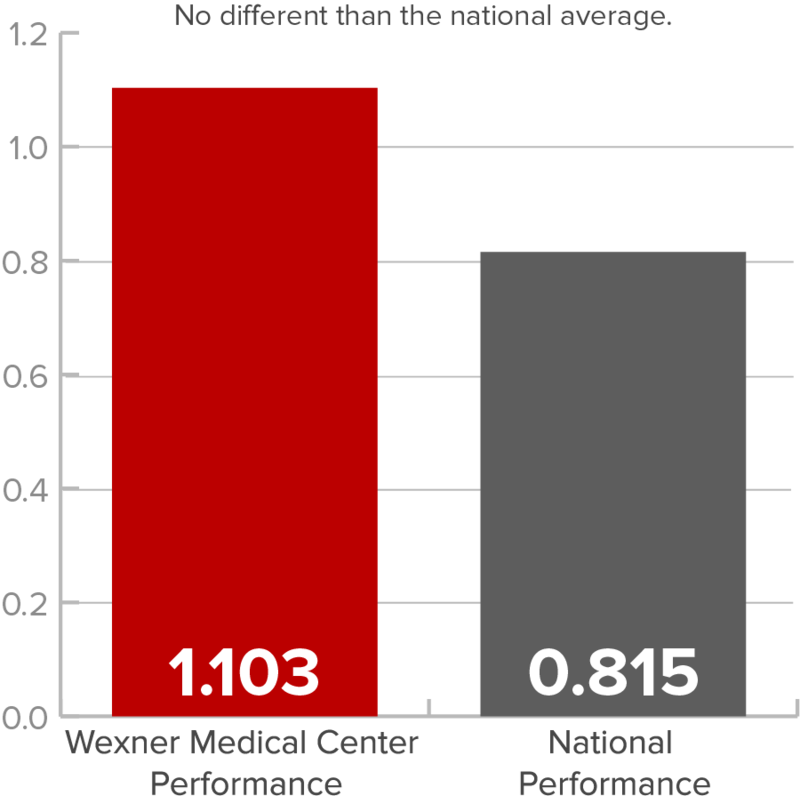 Wexner Medical Center scores are consistent with the national average. A lower rate is better. 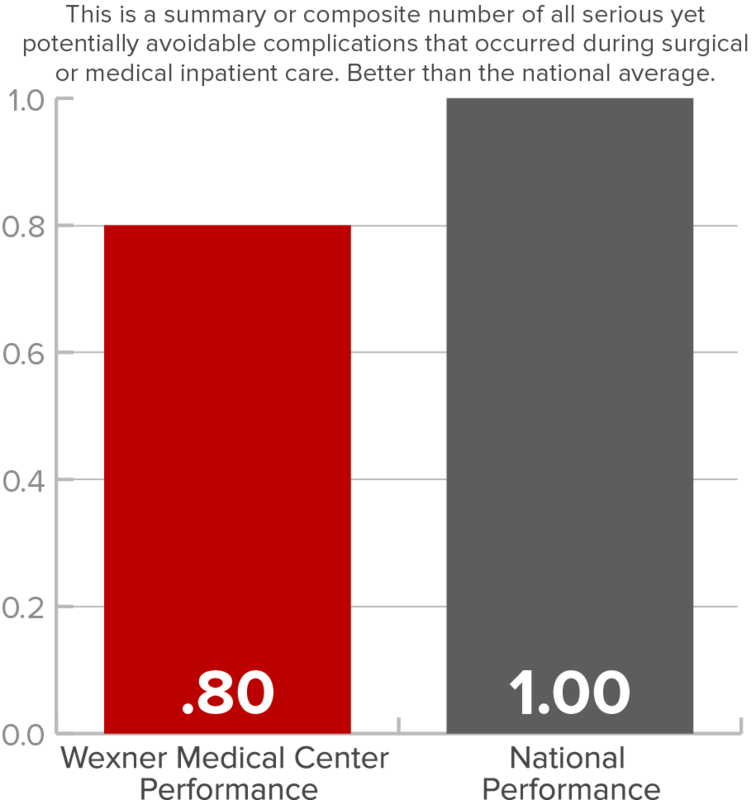 Rate of complications for hip/knee replacement patients 2.9% 2.8% No different than the national average. Healthcare Associated Infections show how often patients in a particular hospital contract certain infections during the course of their medical treatment. These infections can often be prevented when healthcare facilities follow guidelines for safe care. 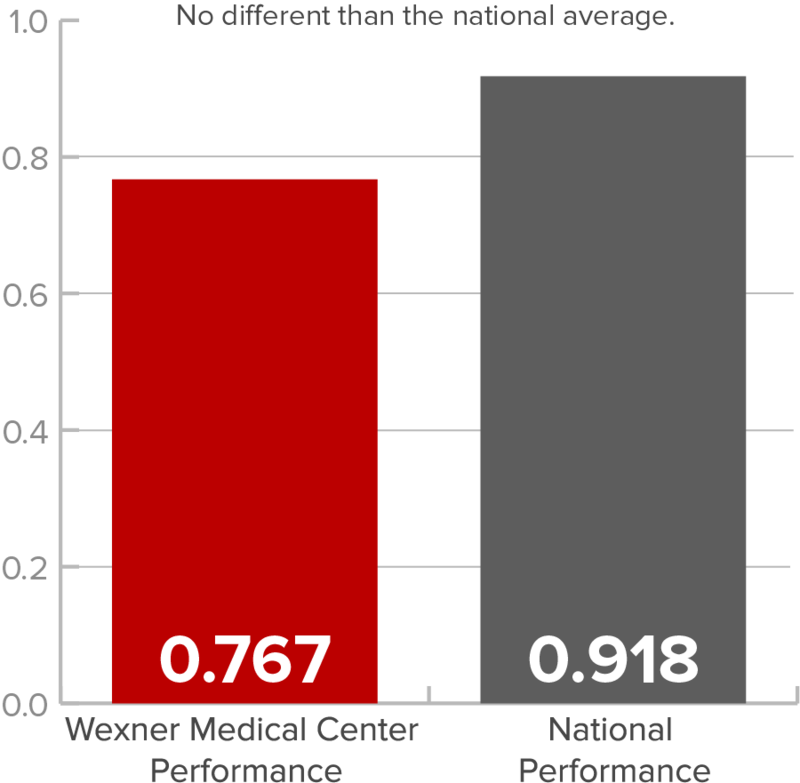 OSU Wexner Medical Center follows these guidelines and performed better than average or the same as the national average in all measures. A lower number is better. 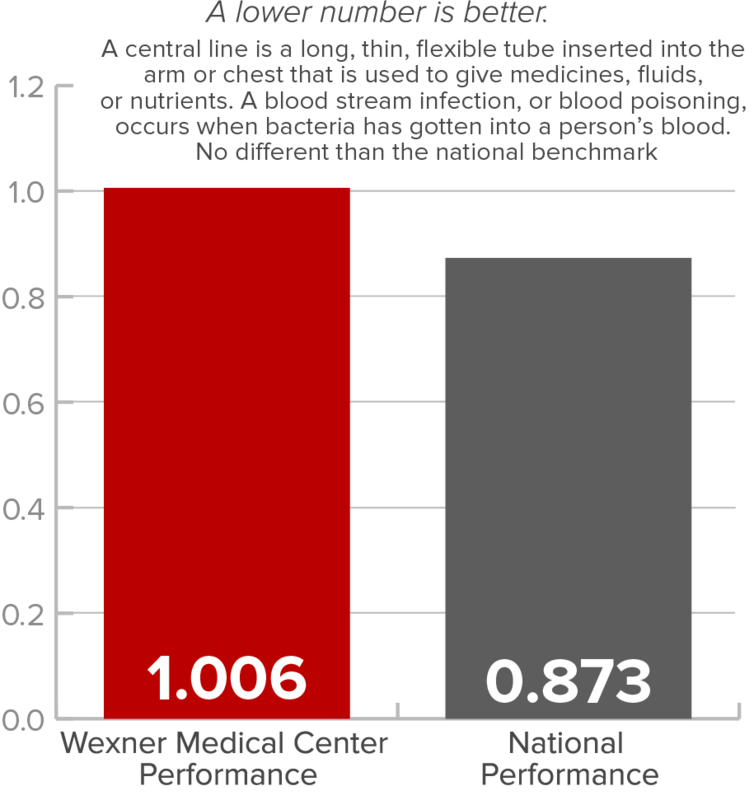 Central Line-Associated Blood Stream Infection (ICU + select wards) 1.006 0.873 A central line is a long, thin, flexible tube inserted into the arm or chest that is used to give medicines, fluids, or nutrients. A blood stream infection, or blood poisoning, occurs when bacteria has gotten into a person’s blood. No different than the national benchmark. Catheter Associated Urinary Tract Infection (ICU + select wards) 0.370 0.916 A catheter is a tiny tube used to drain urine from the bladder. 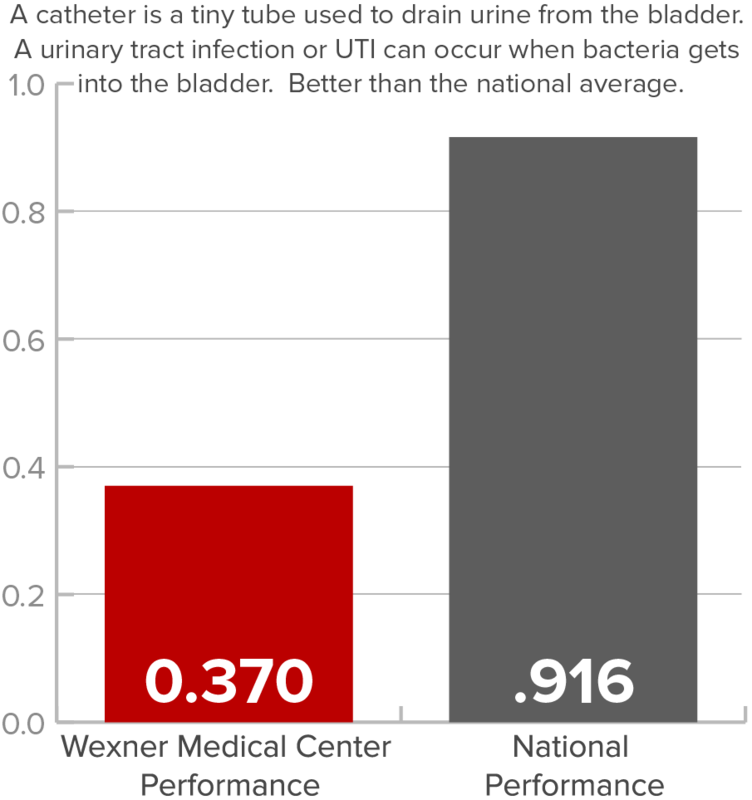 A urinary tract infection or UTI can occur when bacteria gets into the bladder. Better than the national average. 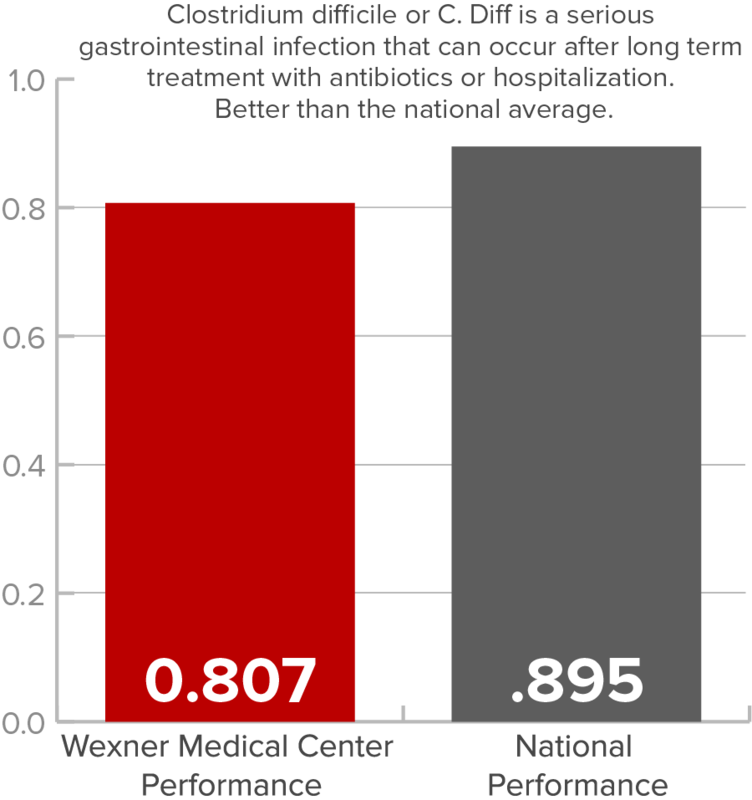 Surgical Site Infection - Colon 0.767 0.918 No different than the national average. 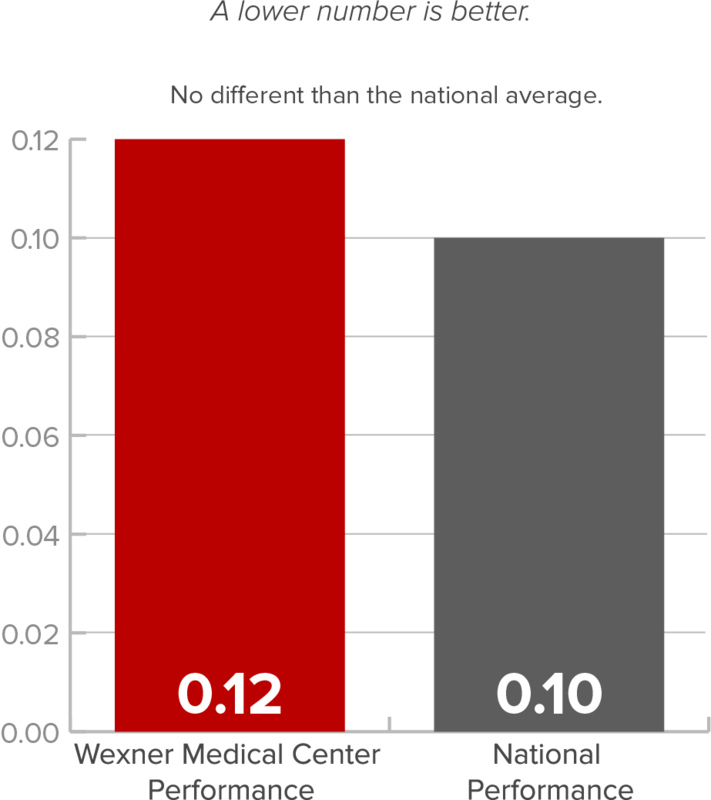 Surgical Site Infection - Abdominal hysterectomy 1.103 0.815 No different than the national average. Methicillin-resistant Staphylococcus Aureusaphylococcus aureus (MRSA) 0.548 0.924 MRSA is a bacterium that causes infections in different parts of the body. It is difficult to treat because it is resistant to many different types of antibiotics. Better than the national average. Clostridium difficile Infections 0.807 0.895 CClostridium difficile or C. Diff is a serious gastrointestinal infection that can occur after long term treatment with antibiotics or hospitalization. Better than the national average.